Identification: Small. Male abdomen is black with a red tip, female abdomen is black. 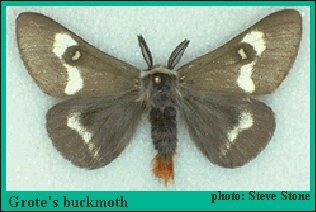 Upperside of forewing is brown; hindwing is darker brown to black. Each wing has a cream-colored band which may not be complete; some individuals have only a few spots. Where the forewing band is present, it is divided by the white-centered cell spot. Wing Span: 2 1/8 - 2 11/16 inches (5.4 - 6.8 cm). Life History: Females lay their eggs in rings around twigs of the host plants. Eggs overwinter and hatch in March or April. Young caterpillars feed gregariously on oak flowers, while older ones feed alone on flowers and leaves. 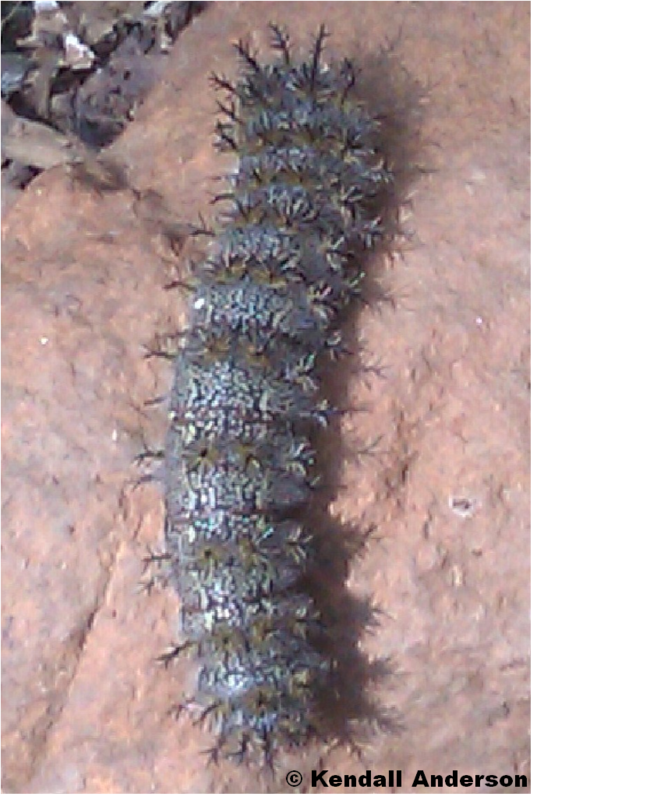 Fully-grown caterpillars wander for a few days before spinning a cocoon in leaf litter on the ground. Caterpillar Hosts: Texas live oak (Quercus fusiformis), Nuttall oak (Q. texana), blackjack oak (Q. marilandica), Gambel oak (Q. gambelii), Emory oak (Q. emoryi), and scrub live oak (Q. turbinella). Habitat: Hills and mountains with oaks. Range: Central Texas; eastern New Mexico; and central Arizona to central Colorado.